You’d be hard-pressed to find a closet without a single piece of clothing made from denim. According to FashionUnited Business Intelligence, 1.25 billion jeans are sold annually worldwide, with women owning 7 pairs of jeans on average and men owning 6 pairs. 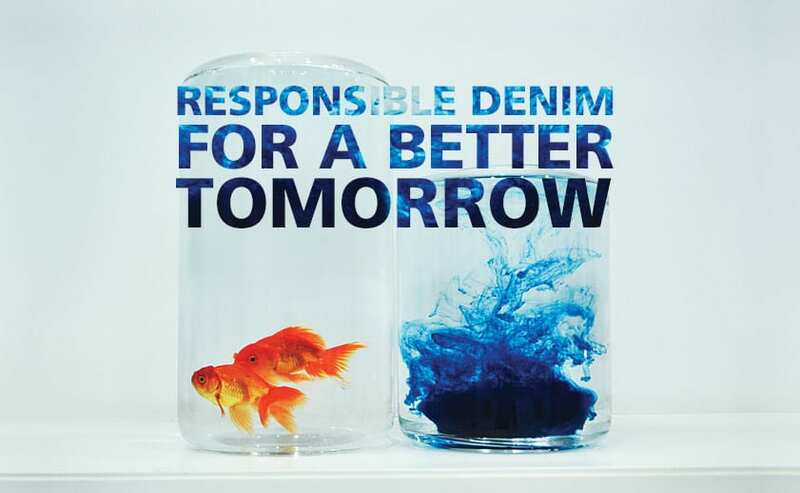 As one of the most purchased fabrics on the planet, denim has a huge impact on our resources. It takes 20,000 litres of water to produce one kilogram of cotton for a single pair of jeans. Factor in the hazardous health effects caused by indigo dyeing and denim finishing, and you have a basic wardrobe staple that affects both people and planet at a very large scale. 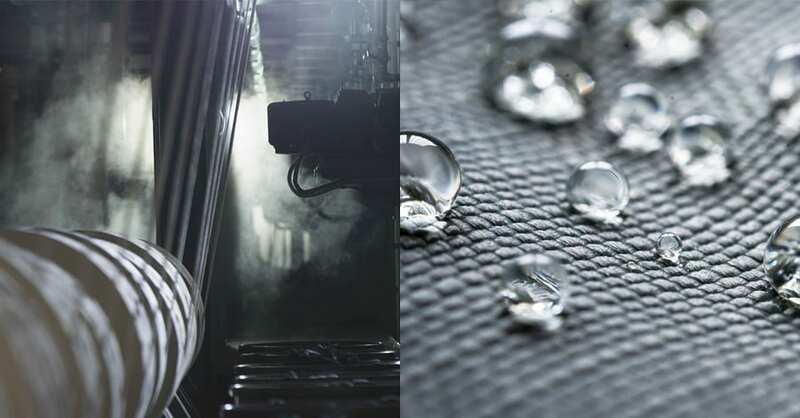 One of the mills investing in innovative technology to help lower the environmental impact of denim manufacture is Advance Denim, a core exhibitor at our recent Future Fabrics Expo in January 2019. Founded in 1987 in China, Advance Denim is a key player in the industry with an annual output of up to 40 million yards of fabric. 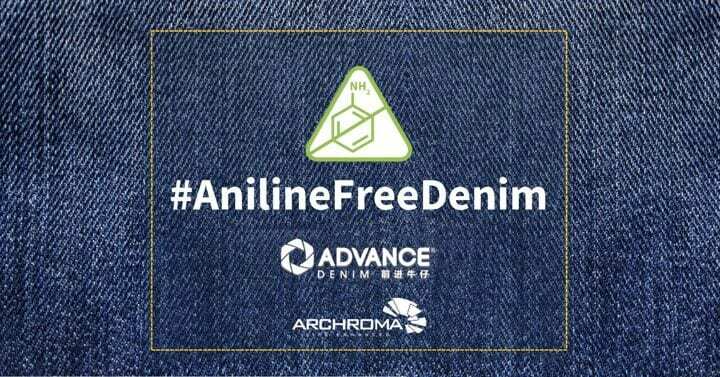 With sustainable initiatives such as aniline-free dyeing with Archroma’s Denisol® Pure Indigo 30 liq, Zero Cotton fabric made with TENCEL™ fibres, and Greenlet™ ecore yarn, the company’s commitment to constantly improve their production processes and techniques dispels several myths around sustainable manufacture in China. For our latest Masterclass, we asked Enrico Forin from Advance Denim to be our guest speaker and discuss the realities of producing more sustainable denim in China, as well as the changes the industry has seen within the past few years. We caught up with Forin after the workshop to learn a little more about the company and their ethos. The Sustainable Angle: What are the main products Advance Denim creates, and what key aspects make them more sustainable than conventionally-produced denim? 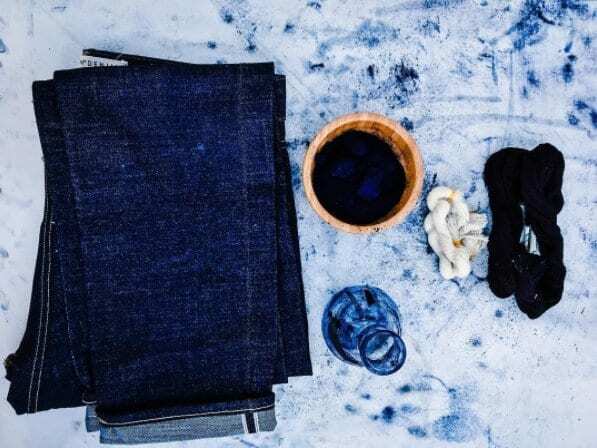 Enrico Forin: Since 1987, Advance Denim has been producing a wide range of indigo products, from traditional denim, intricate jacquards, smooth flexible coatings to real indigo knits. Currently, Advance Denim is focusing considerable efforts to produce a wide array of fabrics in the most sustainable way possible, by applying creative and technical expertise to solve manufacturing challenges affecting our natural resources, such as water, energy and waste. We are planning on reaching our sustainability goals by using eco contents to build the fabrics as well as cleaning up the entire manufacturing process. TSA: How can fashion have a positive impact on nature and communities? EF: More and more fashion brands now are sensitive to the ecological impacts of the fabric, accessories and trims that make up their collections. These brands are now making a conscious effort to source recycled materials wherever possible. This is already a considerable step forward and will have a positive impact since less natural resources will be consumed. This reduced consumption of raw materials will consequently benefit communities, especially in locations on the planet where raw materials are scarce. EF: I don’t see any major obstacles that could block the improvement of sustainability in our industry. Since there are sustainable chemicals, equipment and technologies that are currently available in the market, it is up to each company to invest in a sustainable future. We believe that it is just a matter of ethics and social responsibility. TSA: What are the goals and plans moving forward for Advance Denim? EF: Advance Denim has a detailed and aggressive sustainability initiative. We are planning to have green fibres account for 90% of our products in the next 5 years. We will also be investing in new technologies throughout the entire production line that will further reduce water and energy consumption. 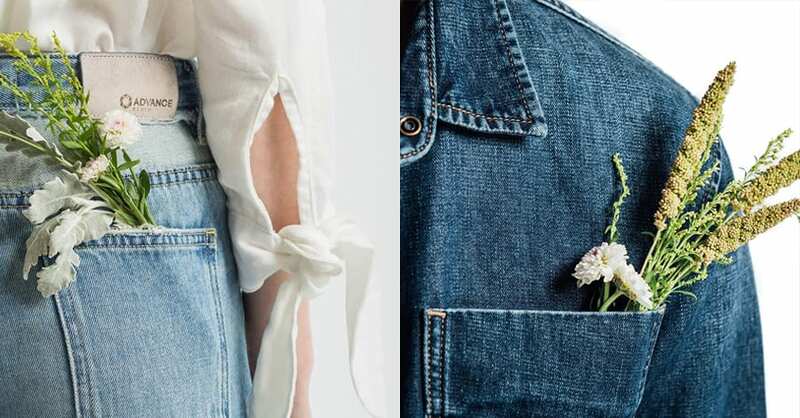 Though Advance Denim will be making a considerable investment in new sustainable technologies, we are attempting to limit the effect that these investments have on the cost of the final product, and in some cases, the effect may be cost-neutral. For updates on our events, initiatives, and suppliers, follow us on Instagram and Twitter . At the Sustainable Angle we spend much of our time researching and sourcing innovative textiles and materials with a lower environmental footprint and reducing the fashion industry’s over-dependency on conventional cotton and polyester. These materials are showcased in the annual Future Fabrics Expo as well as in workshops and Pop ups throughout the year, and a curated selection on www.futurefabricsvirtualexpo.com. This year we are delighted to have Orange Fiber’s innovations included in the 6th Future Fabrics Expo 25 – 26th January 2017. In a time where fertile land is fast becoming a limited natural resource, innovative solutions are needed. 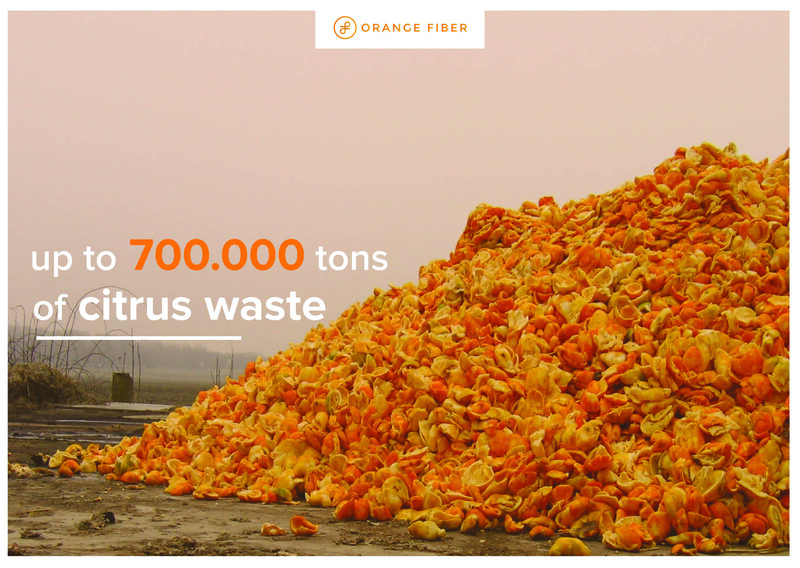 The Italian Start-up Orange Fiber uses citrus waste, a by-product from the Italian juice industry to produce high quality textile fibres with a low environmental impact. Sicily has a massive production of citrus juice, which every year also leaves around 700 tons of waste materials. 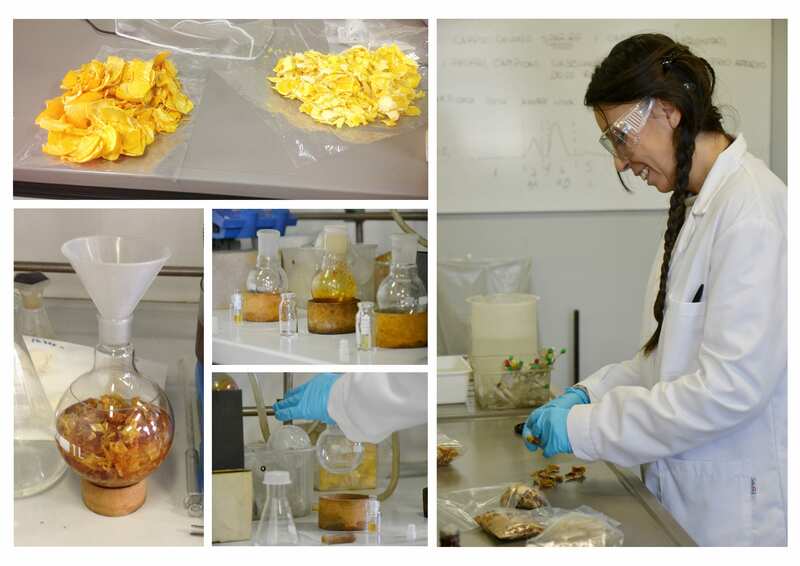 The two co-founders of Orange Fiber, Adriana Santanocito and Enrica Arena, saw the potential in this and developed a system where Orange Fiber converts orange peels, a by-product from the Sicilian juice industry, into high qualitative cellulose fibres. The Sustainable Angle asked Orange Fiber a few questions about their innovation and what they believe the future holds for the textile industry. TSA: Can you provide a brief outline about what Orange Fiber is and how it has evolved since its inception? OF: Orange Fiber is an Italian company that uses an innovative process to creates sustainable textiles for Fashion from citrus fruit by-products. Having created a supply chain network with partner companies we opened the first industrial plant in Sicily and produced different prototypes. The first textile production has been completed and some interesting top fashion brand proposals are being evaluated in view of entering the market by 2016. TSA: What first inspired you to start to develop Orange Fiber? 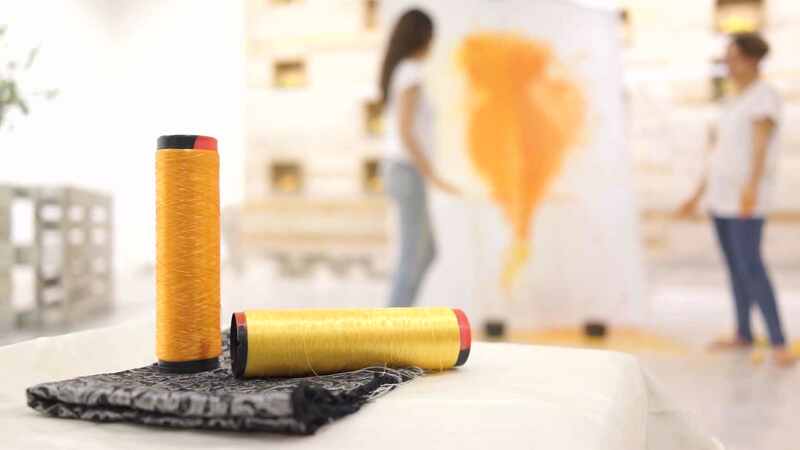 OF: Orange Fiber’s idea is the result of a deep love for our homeland of Sicily, blended with the desire to innovate in a sustainable way; the Italian industry, known for its excellence in textile production. The Orange Fiber supply chain from citrus by-product through spinning, weaving and finishing is our contribution towards sustainable fashion practice and economic, social and environmental development. In 2011, Adriana Santanocito was studying Fashion Design and innovative materials at Afol Moda Institute of Milan, when she heard of the sustainable textiles trend, and decided to explore the subject in her thesis. By simply discussing this with citrus juice producers she discovered the problem behind the disposal of citrus waste and had the intuition to transform citrus juice by-products into a new product that would represent a brand new opportunity for Italian tradition in high quality fashion textiles. She shared the idea with Enrica Arena, and with creativity and will, they started Orange Fiber. TSA: Can you tell us about any positive environmental / social impacts you have seen or expect to see as a result of Orange Fiber? OF: Our innovative and patented process reduces the cost and the environmental impact of pollution related to the industrial waste of citrus juicing, by extracting a raw material apt for spinning. Our solution offers the opportunity to satisfy the increasing need of cellulose for textile, thus preserving natural resources. This process reuses waste products, saves land, water and environmental pollution. TSA: At the moment Orange Fiber is a very new and small-scale innovation. How do you expect it to be used by the industry in the future? OF: We will complete the process of research and development, optimise the cost of production and start replicating the plant in Italy and abroad. Italy produces just 4% of the worlds citrus juice, so the opportunities to replicate the process are endless, and will allow us to lower the product price, becoming competitive with materials such as polyester and cotton. TSA: The fashion and textiles industries are some of the worst offenders out there for negative environmental and social impact. What do you think are the most pressing environmental and social challenges that we are facing in the industry? educate consumer behaviour and shopping habits, encouraging conscious and sustainable attitude. OF: We believe that the biggest obstacle for the fashion industry is the fast fashion and high volume consumerist approach we have come to see. This supply chain reduces R&D and sustainability efforts in order to keep low price points and give consumers more choice. TSA: What are your plans moving forward? OF: Since we strongly believe that “the future is not a place we’re going to, but a place we create”, we will continue to research and develop products and new raw materials, working on industrial scale-up and improving our process according to circular economy principles. Our aim is to establish Orange Fiber as the first Italian brand to move into the sustainable textiles industry, through “green” production from renewable sources and contribute to creating a greener fashion industry. TSA: How can industry professionals and consumers get involved and engage with the work you are doing? 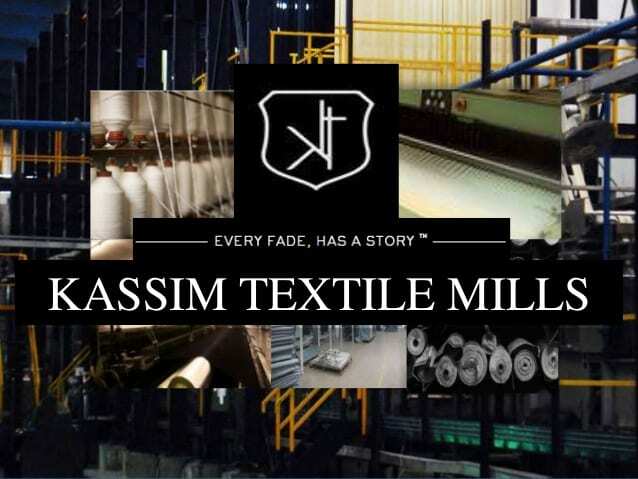 OF: We are creating a B2B2C product addressing the need of fashion brands to use a high quality sustainable and innovative textile for their collections and the need of the consumer to have access to high quality sustainable clothing. 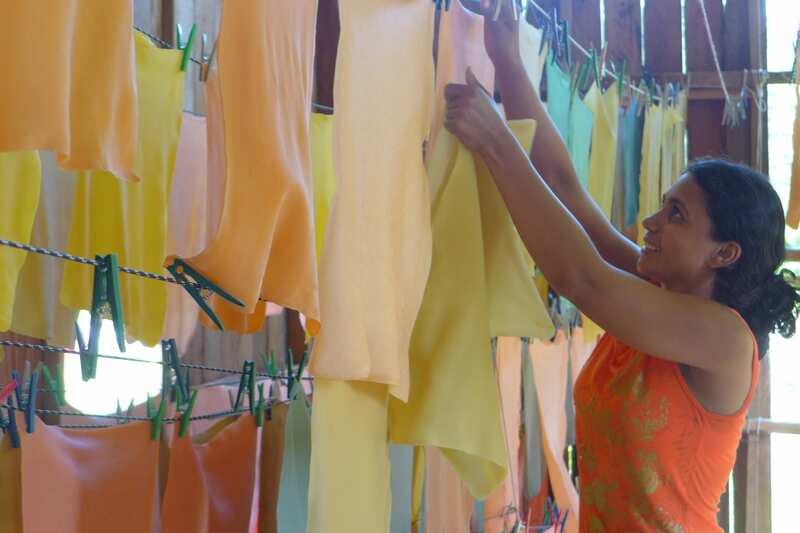 Establishing Orange Fiber as an Ingredient Brand, we aim to get involved and engage with industry professionals and consumers working on the added value of the fiber origin and its environmental and social sustainability. 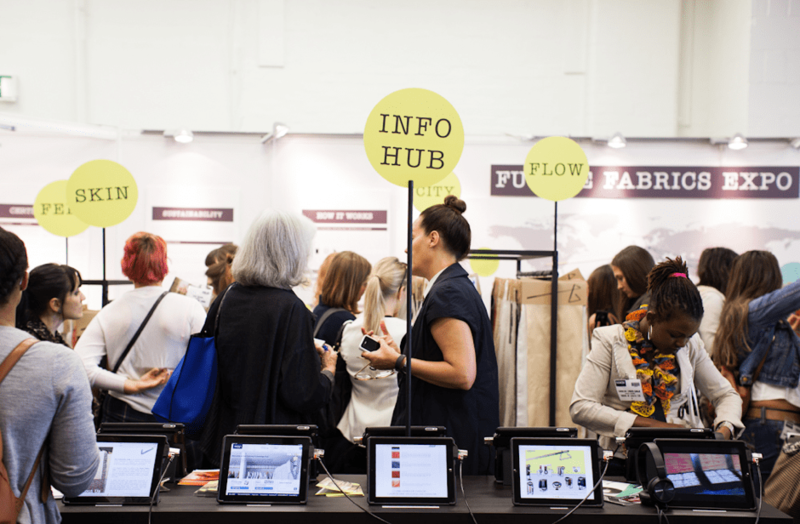 At The Sustainable Angle we spend much of our time researching and sourcing both innovative and sustainable materials to showcase in the annual Future Fabrics Expo. We show a wide range of alternatives with a lower environmental and social impact to cotton, polyester and conventional leather. These materials are also shown in other events and workshops throughout the year, and on www.futurefabricsvirtualexpo.com. Atlantic Leather is an Icelandic tannery leading in manufacturing exotic leather from fish-skin which are waste products from the food industry. No fish used are endangered species. 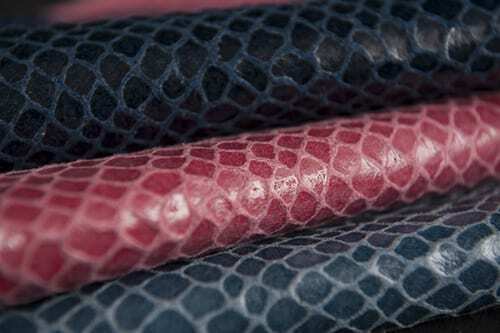 The fish-leather is produced from four different species of fish; Salmon, perch, wolffish and cod – each with its own unique characteristics – in a diverse range of colours, textures and finishes, all have been tested by the European Chemical Agency. Atlantic Leather is stationed in Sauðárkrókur, a small but vibrant community of roughly 4000 inhabitants, located in the heart of Skagafjörður, Iceland. 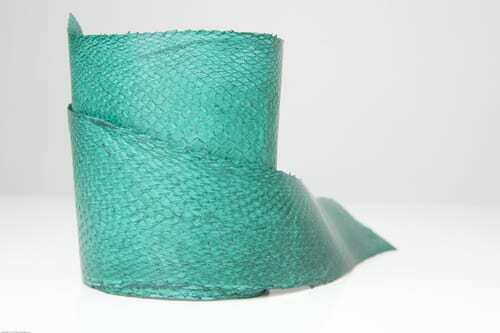 The development of the fish leather has been processed since 1994, but the idea itself is rooted in tradition. 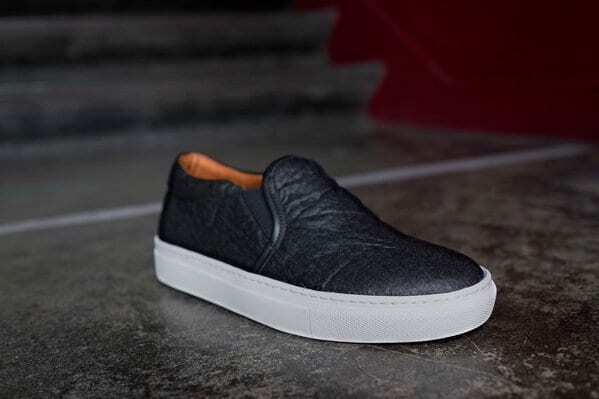 We have been lucky enough to interview Atlantic leather’s Manager Sigurlaug Vordís Eysteinsdóttir, to find out more about Atlantic Leather, and how fashion businesses and consumers cannot only use this material but visit where it is made. TSA: Firstly, can you tell us what sustainability means to Atlantic Leather? Atlantic Leather: Sustainability means the power of nature to us at Atlantic Leather. Respect nature and it’s power. TSA: Can you provide a brief outline about the products Atlantic Leather creates, and what makes them more sustainable than other leathers? Atlantic Leather: We produce Salmon, Perch, Cod and Wolffish leather from the by-product from the food industry. We also produce washable Salmon and Salmon tanned from the bark of the Mimosa tree. We turn waste products from the food industry into exotic luxury leather by using the power of nature. In Iceland we are fortunate to have plenty of hot water from geothermal sources, and our electricity comes from a hydroelectric power station. So we rely on the power of nature; exotic and eco-friendly. TSA: What was the inspiration behind using fish skins to create leather for the fashion industry? Atlantic Leather: Icelanders are known for reusing everything that others think is trash and we still have our ancestor’s spirit of finding the useful in everything. Iceland is a big fishing industry nation, our ancestors used the fish skins for their shoes, so the inspiration was, find a use for 100% of each fish Icelanders catch and Icelanders are on our way to completing that task, Atlantic Leather is a big part of that project. TSA: Can you tell us about any positive environmental / social impacts you have seen or expect to see as a result of Atlantic Leather? Atlantic Leather: Firstly, we don’t have any leather from endangered species, many designers have gone from snake skin to our Salmon skin for example. Atlantic Leather is the only tannery in Iceland and is based in the north of Iceland in a society with a population of 4000. Atlantic Leather was voted the best Tannery of the year in the European section that is a big recognition in our small country. Our leather is inspiring for people, we have so many colours and varieties of finish. TSA: The fashion and textiles industries are some of the worst offenders out there for negative environmental and social impact. What do you think are the most pressing environmental and social challenges that we are facing in the industry? Atlantic Leather: Money is the most challenging thing for tanneries. It costs a lot to be sustainable and because we are, then it makes our products expensive in the end. It is also important to stop playing hide and seek and start to open the tanneries up to customers so they can see it with their own eyes and be informed about sustainability. To be truly environmental you have to not be afraid to inform how you carry out the task, and when asked ethical questions, not being afraid of the answer. Atlantic Leather: Just keeping up our 20-year process in our tanning product, keeping up our developments, and marketing our products more. 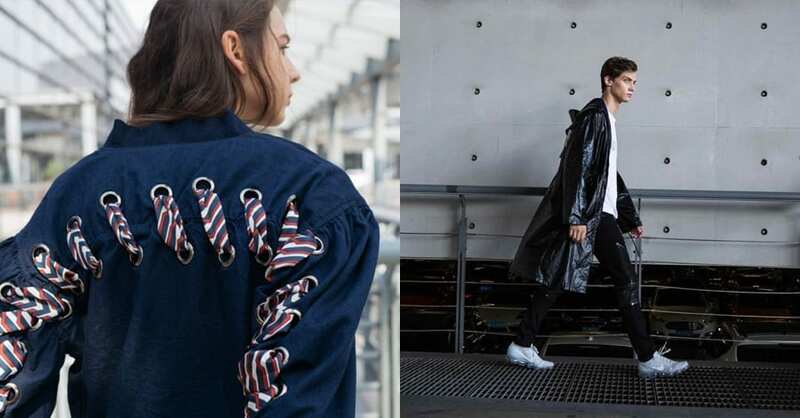 Staged by the world’s leading trend authority, WGSN Futures 2016 brought together leaders from fashion and the creative sectors to debate and define the key trends that will shape the industry over the next 15 years. The talks explored the major trends in design, technology & communications, consumer behaviour and retail, presented by global industry thought leaders and WGSN experts. The flagship summit took place in London, where 300 senior-level delegates in the fields of strategy (c-suite), design, marketing, retail and digital gathered to hear WGSN’s own experts and analysts and a panel of world-class industry experts share their insights. The panel discussion on sustainability took place between Nina Marenzi from The Sustainable Angle, Orsola de Castro of Fashion Revolution, designer Christopher Raeburn, and Amy White from Avery Dennison, a world leader in supply chain solutions working with some of the world’s leading emerging designers to help them introduce sustainability into the design process. Last year we announced our partnership with Avery Dennison, intended to provide leading apparel brands with innovative sustainable solutions by combining the unique capabilities and expertise of each company to drive the future use of new sustainable materials in apparel branding. The panel addressed the idea that for brands to start being more sustainable it’s key to begin by stating a vision of what they are trying to achieve to be more responsible, rather than immediately defining specific targets which may not be reachable. Design should take centre stage, with sustainability as a design constraint leading to more responsible decisions. Finally recognising the power of communication, Orsola voiced a wish that those brands already working with sustainability at the core of their business would be more vocal, coming forward to share what they already do to be more responsible – after all the industry is on a journey, for which transparency and collaboration is essential. 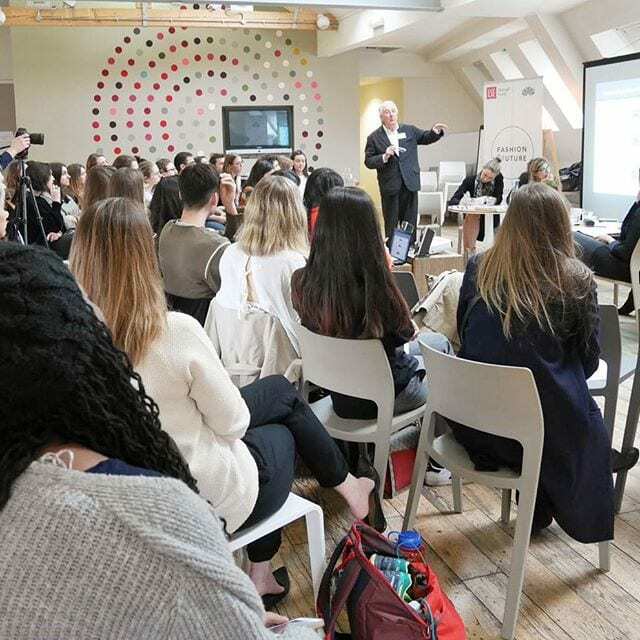 A few weeks ago The Sustainable Angle took part in the first “Threads: Rethinking Fashion” event hosted by Impact Hub Kings Cross and Ashoka Changemakers. The talks were designed as an exploratory series to support innovations for a fair and sustainable supply chain, covering a range of topics throughout the series. 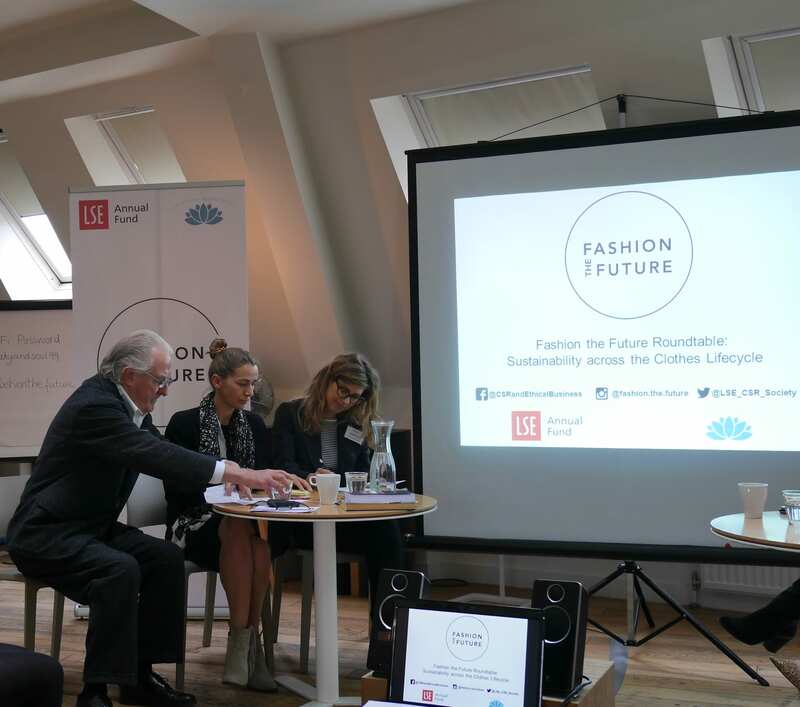 Coinciding with London Fashion Week, the first in the series “From fibre to fabrics: Sustainable sourcing practices to procure raw materials” explored current sustainable practices, showcasing live case studies and Q&As. The featured speakers were TSA’s researcher and project manager Charlotte Turner, and Christopher Stopes of Global Organic Textile Standard (GOTS). The event gave industry professionals, students, and those simply interested in finding out more the opportunity to learn about and discuss challenging issues and positive solutions currently facing the fashion and textiles industries, as well as discover some of the beautiful sustainable materials currently available on the international market. It was great to see the audience ranging from professionals from high-end luxury fashion brands and start-ups, to fashion students and general consumers. 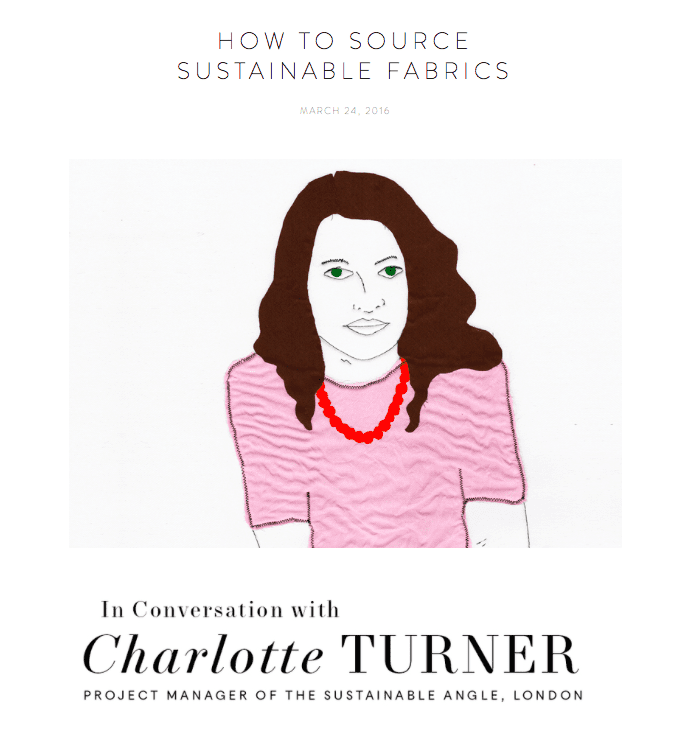 To follow up this event, one of those behind “Threads”, the new sustainable fashion and lifestyle website The Lissome, interviewed Charlotte to find out more about sustainable fashion and materials, sustainable sourcing and how we assess sustainability, plus emerging brands and tips for living more sustainably. At The Sustainable Angle we spend much of our time researching and sourcing both innovative and humble sustainable materials, in the interests of reducing the fashion industry’s over-dependency on cotton and polyester. These materials are showcased at the Future Fabrics Expo as well as other events and workshops throughout the year, and on www.futurefabricsvirtualexpo.com. Few of our discoveries have been as exciting as Piñatex by Ananas Anam, a non-woven material made from the fibre of pineapple leaves, ideal as a leather alternative for accessories including bags and footwear. We’ve had the pleasure of showcasing Piñatex on numerous occasions already since its launch in 2015, including at the 5th Future Fabrics Expo, INSPIRE ISPO Munich, and at our recent sustainable materials workshop hosted in conjunction with UKTI and UKFT. 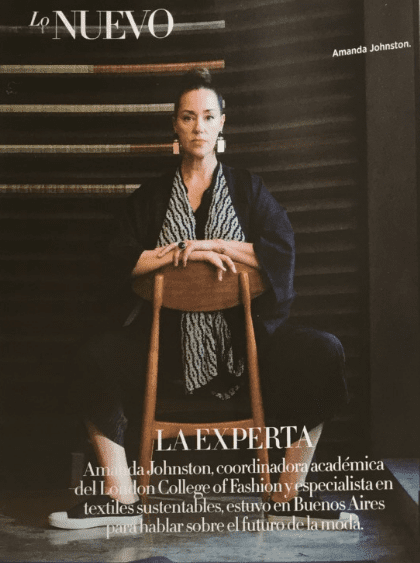 We decided to interview Piñatex’s creator, Carmen Hijosa, to find out more about Piñatex, and how fashion businesses and consumers can get their hands on this material. TSA: Can you provide a brief outline about what Piñatex is and how it has evolved since its inception? Ananas Anam: Piñatex is a natural and non-woven textile made from pineapple leaf fibres, which is the by-product of the pineapple harvest and as such Piñatex is made from an agricultural waste. After significant research and development through a PhD at the Royal College of Art in London by Carmen Hijosa, Piñatex was launched in 2015. Today, Piñatex is developed through the company Ananas Anam, launched in 2014 by Carmen Hijosa. The company is part of the InnovationRCA department of the Royal College of Art. Piñatex is sold only business to business, different products such as shoes, bags, accessories, clothes and furnishing products have been made from Piñatex. TSA: It’s an amazing material, what first inspired you to start develop it? Was it a desire to improve sustainability in the fashion / textiles industries or something else? Ananas Anam: As a designer, my objective was to create a product that carried social and ecological responsibility throughout its Life Cycle, and through it, do something about how to sustain and indeed to heal planet earth through our actions, at the same time than helping the pineapple farming communities in the Philippines, where the pineapple fibres come from today. 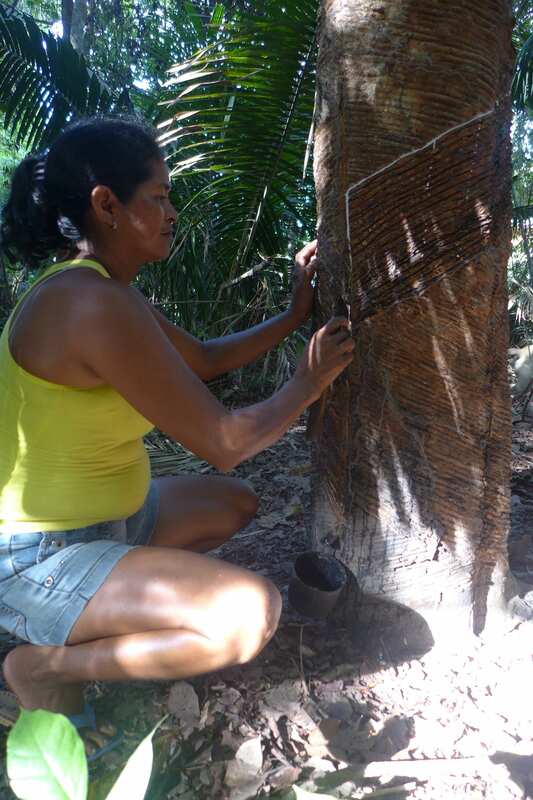 Thanks to my research and the ethical views behind Piñatex, a new and sustainable material was created. Piñatex represents a sustainable solution in the face of today’s social and sustainable dilemmas. TSA: Can you tell us about any positive environmental / social impacts you have seen or expect to see as a result of Piñatex? Ananas Anam: Piñatex does not need any land, nor does it use any water, fertilizers or pesticides, as it is a waste from the pineapple harvest. This is quite unique in the textile world, especially when we consider that pineapple is the second most popular fruit in the world, and without having to plant any extra, we have an abundant source of raw material to manufacture Piñatex. Following the Cradle to Cradle philosophy, Piñatex represents much more than a new material, it also involves a societal and civilizational change. Ananas Anam offers the opportunity to empower pineapple communities throughout the world by making them and to make them more self-reliant and sustainable, as the harvesting of the fibres gives them an added income, with extra potential to use the bio-mass left from the extraction of the fibres and convert it into organic fertilizer or bio-fuel. TSA: At the moment Piñatex is a very new and small-scale innovation which has already generated interest from international brands. How do you expect it to scale up and be used by the industry in the future – do you think it could eventually be a mainstream commercially used material, and would you want it to be? Ananas Anam: The supply chain of Piñatex is being developed with the aim to scale up and become a fully functioning industry. 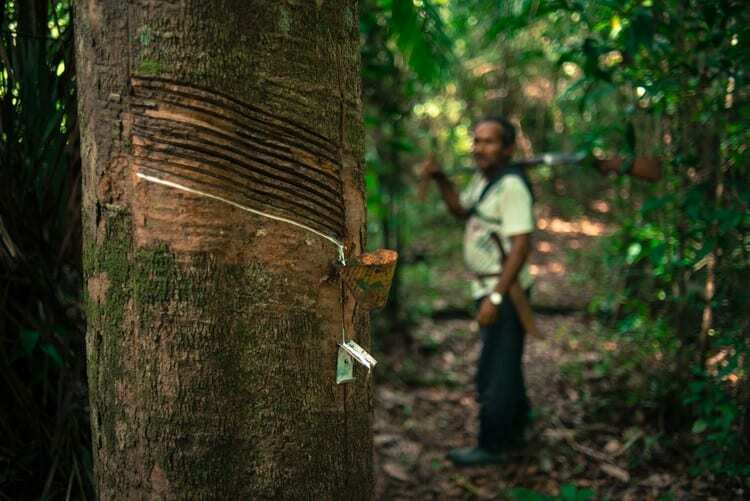 This is the way that everyone in the supply chain will benefit to ensure that Piñatex can become a democratic product, available not just to a few, but to everyone that cares for social and ecological issues. It is my intention to make Piñatex become a mainstream material indeed! Ananas Anam: Textiles need to minimize their negative impact in the environment. I think the most important challenge is about water, as the production of textiles requires an important quantity of water. Regarding the social challenges, there are still unfair working conditions behind the fashion brands, especially in the countries where the cheapest labour is. Ananas Anam: My research led me to the conclusion that the success of synthetics like acrylic, nylon, polyester and polypropylene is due mainly to cost. Within a fast-evolving fashion industry which is more and more driven by the success of fast fashion brands, the production keeps accelerating and puts priority on quantity rather than quality. However, trend analysis tends to show a change in customers’ mindset. Indeed, people pay more and more attention to who, how, where and when the clothes we wear are made. TSA: Can you tell us about your plans moving forward? Ananas Anam: Our objective for 2016 is to consolidate our company and strengthen our team. Once our production is fully consolidated, we intend to reach to a wider customer base, while at the same time continuing the on going Piñatex R&D, to include more textures, surface finishes, and colours to our present range. TSA: Finally, how can industry professionals and consumers get involved and engage with the work you are doing? Ananas Anam: Professionals can engage with Ananas Anam by creating products made of Piñatex. Consumers can get involved by following the evolution of Ananas Anam on the social media. Finally, everyone can share our message on sustainability and our social values. The Sustainable Apparel Coalition is the apparel, footwear and home textile industry’s foremost alliance for sustainability across the entire supply chain, which focuses on developing the Higg Index, a standardized supply chain measurement tool for all levels of industry. We’ll be showcasing SAC at the 5th Future Fabrics Expo to help raise visibility if the coalition and its work, so ahead of this we spoke to Baptiste Carrière-Pradal, VP Europe, to find out more about SAC and the Higg Index. 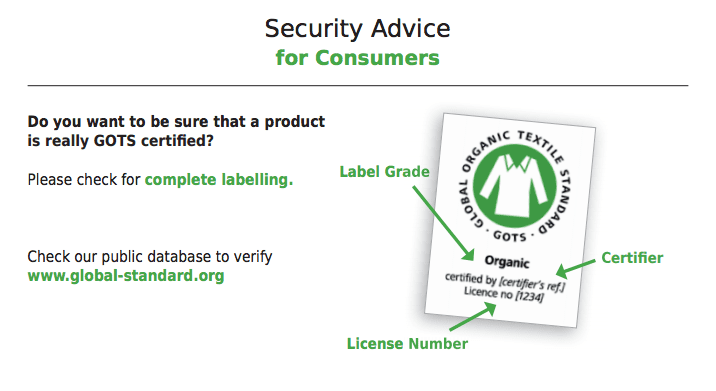 TSA: Can you tell us a bit about the Sustainable Apparel Coalition, and what it set out to do? SAC: The Coalition’s main focus is on defining a common language for our industry: the Higg Index, a standardized supply chain measurement tool for all industry participants to understand the environmental and social and labor impacts of making and selling their products and services. By measuring sustainability performance, the industry can collaboratively address inefficiencies, resolve damaging practices, and achieve the environmental and social transparency that consumers are starting to demand. By joining forces in a Coalition, we can address the urgent, systemic challenges that are impossible to change alone. A common language is also the first step to efficient transparency. TSA: The Sustainable Apparel Coalition represents more than a third of the global apparel and footwear market, which signifies a massive number of companies and products. What do you feel this means for the potential for SAC to have a positive impact on the fashion and textiles industry, from a retailer’s and consumer’s perspective? SAC: The urgency and expanse of the sustainability issues facing the apparel, footwear and home textiles industries requires collective attention on a global scale. This is why collaboration is the heartbeat of the SAC. This collaboration enables brand to shift resources from measuring their impact to improving their social and environmental impacts. Sharing best practices allows members to implement sustainability strategies that are already tried-and-tested by their peers, saving considerable time, money and resources. Through the SAC, member driven, some of the world’s most recognized apparel brands have created the Higg, and are now deploying it in their supply chain. This cost-effective sharing can be especially beneficial to small and medium-sized businesses that also use the SAC to source supply chain partners with exceptional credentials. Brands and retailers join the SAC for access to the essential resources and support they need to credibly and effectively meet their sustainability goals. They use the Higg Index to radically simplify the process of measuring, sharing and benchmarking sustainability performance at every stage of product lifecycles or the retail value chain. This helps to precisely identify areas requiring improvement and highlight robust actions to take. Brands and retailers also join the Coalition to be part of the apparel, footwear and home textiles industry’s largest and most diverse network of people, companies, and organizations focused on creating transformative change. Finally, our members are paving the way to transparency. Once a common language will be used in the supply chain it will become the standard to communicate about factory, product and brand performance with all of the industry stakeholders. Manufacturers join the SAC to improve their sustainability performance using the Coalition’s suite of assessment tools, The Higg Index. The Higg Index radically simplifies and standardizes the process of measuring sustainability performance and sharing it with current and future partners for faster, easier evaluations. Manufacturers also join the Coalition to be part of the apparel, footwear and home textiles industry’s largest and most diverse network of players focused on creating transformative change. TSA: The Sustainable Apparel Coalition developed the Higg Index, which is a tool for measuring both the environmental and the social performance of apparel. 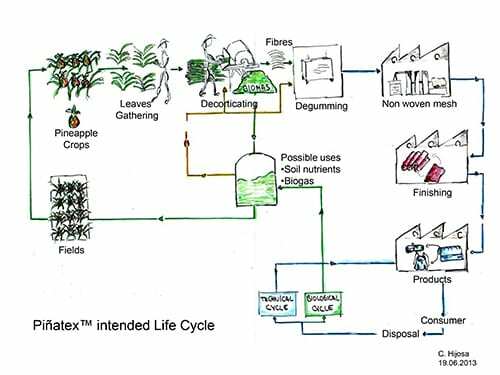 Can you explain how it works, and how it could be used to assess the sustainability of textiles? SAC: The centerpiece of the SAC is The Higg Index, a suite of ground-breaking assessment tools that empower brands, retailers, and manufacturers to measure their environmental and social and labor impacts at every stage of the lifecycle and value chain, and then demonstrate the data in a standardized and simplified way. For those just starting to implement sustainable practices, The Higg Index guides their important first steps, helping to distinguish strengths and weaknesses in the supply chain. For those already deeply engaged, it has more advanced potential, such as benchmarking sustainability performance against other SAC members, identifying macro risks and performing targeted research and analytics. TSA: The fashion and textiles industries are globalized on a huge scale, and one of the most environmentally impactful industries out there. What do you think are the most pressing environmental and social challenges that we are facing in the industry? SAC: We have at the SAC an holistic view on those challenges, considering that each of the topics has a consequence on others and that it is only on the long run that we will collectively more towards a more sustainable industry. TSA: Where do you see the most potential for change in the fashion and textiles industries? SAC: Much progress has been made in the past decade on specific topics. However, the potential for change is huge, with a better integration of the sustainability challenges and opportunities upstream, for instance at designer level. SAC: Open access to the individuals and organizations driving the shift to sustainable production is perhaps the greatest reward for joining the SAC. Members commit to radical cooperation to meet shared goals, peers and competitors share tried-and-tested practices and sustainability leaders help new adopters map the path forward. SAC members inform, invigorate and sustain each other along the challenging road of transforming sustainability goals into realities. No company alone can shift the existing industry paradigms. To ignite the change required to redefine the way the industry is run, peers and competitors come together as a united front, adhering to the Coalition’s set of core collaboration values that are designed to further impactful change across the industry. Through SAC membership, brands, retailers and manufacturers commit to transparency and the sharing of best practices, a full-circle collaboration that benefits all involved. We recently had the pleasure of welcoming Leatherteq to the London College of Fashion, to debut their innovative Litehide technology for the first time in the UK. The Sustainable Angle’s director Amanda Johnston hosted the evening lecture, led by Desmond Ko of Leatherteq with guest speaker Morgaine McGee, Vice President Product Development for Signal Brands, one of the world’s largest global distributors for leather accessories. The lecture was designed to engage both students, and those already working in industry, with what’s involved in earlier often forgotten stages of the leather supply chain, and to find out ways we can reduce the impacts caused by existing leather preservation processes. Litehide offers a solution, as an innovative patented system designed to address the regulatory and environmental challenges now faced by the global leather industry, through reducing the impact, and increasing the performance of hide preservation. We spoke to Desmond Ko, Leatherteq Limited’s Director, to find out more about the inspiration behind Litehide, and the impact it is set to have on the leather industry. TSA: Can you tell us what was the motivation to develop Litehide? DK: Salt is currently the main method of preserving hides. About 20lbs of salt is typically used per hide. The used salt is contaminated with biological waste material. Salt, when introduced in high quantities is detrimental to both subterranean and ground fresh water supplies. This is a problem associated with the leather industry that has not been truly addressed. Litehide is an alternative method of preservation that completely eliminates the need for salt and therefore the salt pollution issue associated with it. TSA: We think it’s important to be clear about the language we use, so is there a way you define ‘sustainability’ in relation to your work? DK: I think more in terms of sustainable development rather than sustainability. The majority of hides are currently preserved using substantial amounts of salt (as mentioned, 20lbs per hide). The majority of these salted hides end up being in developing countries for tanning. This results in significant salt pollution for these countries, and this is on top of the tanning chemicals used. Before Litehide, there has not been another cost effective and efficient manner for hide preservation. As Litehide is a salt free dehydrated hide ready for the art of tanning, this replacement technology is sustainable, saves money and provides a better form of the same raw material. TSA: With this in mind, can you tell us a bit about your goals for Litehide? DK: We have a simple goal, that is, to replace salted hides with Litehide on a global scale. To achieve that, we start with meatpackers (whom harvest the hides and traditionally salt them). Now we also share this idea with brands that collectively have the commercial authority to demand greener hides for their leather. TSA: From the outside it looks like Litehide wasn’t a straightforward innovation to develop – how has it has evolved since its inception? DK: The vision and the strategy of the business has largely remained the same. That is to license the technology. I think the evolution is for the people that work within the company. Most of us have business or finance backgrounds. It has been a challenge for us to learn the leather business. That goes for the whole supply chain from meat packers to fashion brands. The learning curve has been steep but we have had fantastic support all along…. Luckily, Litehide, the product, has not needed to evolve from its original concept. We and our partners continue to find benefits and advantages as a better form of the same raw material. TSA: Can you tell us about any positive impact you have seen as a result of Litehide technology? DK: We know we are impacting positively upon the global environment. Particularly rewarding is how well received Litehide is from meatpackers, tanners through to brands (these include automotive, upholstery, shoes, clothing and handbags companies). Our partners appreciate the sustainability credentials, supply chain and cost savings…. TSA: Litehide is a very specific solution for an early stage of the leather supply chain. What do you think are the most pressing environmental and social challenges in the leather industry? DK: Perhaps correctly, the world has largely focused on the tanners being the main polluting party. Most tanners are attempting to adopt the 3Rs (Reuse, Reduce, Recycle). Hence, they are able to “do something” with the tanning chemicals. However, typically 60% of the total dissolved solids of a tanner’s effluent stream come from the salt used in preservation, which they do not have much control over. Hence a technology like Litehide will help both at source (the meatpackers), at the tanner and resulting in greener leathers for the brands. TSA: Do you think there are any aspects the industry needs to improve on overall? Not so much things for the industry to improve upon but matters for the industry to consider. I think it is unusual for someone to have access across the entire leather supply chain. We have been privileged. We see a few recurring themes…. Hide prices continue to rise due to demand exceeding supply. Hide prices have risen 60% over the last four years. Hence this has a direct affect on finished leather prices. Brands are trying to be sustainable but are still very cost sensitive whilst margins for tanners are very thin. We see a wave of sustainable capsule lines for leading brands. We see more tanners going for green audits/certification. We also forecast consolidation for tanners where the big and the niche will survive. Consumers are used to purchasing flawless leather articles and I (as a consumer) can identify with that. However, each animal is different and its hide/skin is usually not perfect. It would be great to see consumers celebrate the imperfections of each individual animal in leather articles. TSA: Industry is slow to change the way things are done and the impact we are having. What do you think can be done to become a more sustainable and less harmful industry? DK: Thinking about leather, two quick fixes spring to mind. Addressing chemicals used in preservation and tanning goes a long way. Brands and consumers understanding the beauty of individual animals (with their natural flaws and all) and hence using more of the hide rather than discarding the flaws…. DK: We are a new growing business. One thing we have not been doing is marketing. The lecture at London College of Fashion in March was our first “public” Litehide event. Now that we have signed up clients that will have product in the market in 2015, we are preparing to be more public about Litehide in the second half of this year. TSA: And finally, how can industry professionals and consumers get involved and engage with the work you are doing? DK: The reality is that consumers buy finished articles and the brands source finished leather. It would be ideal if both parties can consider the leather’s origins, which in this case is the often imperfect hide and how much of a miracle tanners perform in turning these into seamless articles. With only days to go before the 4th Future Fabrics Expo opens at London Olympia Exhibition Centre (28th-30th September), we’re looking forward to showcasing some other organisations that are doing important work in the field of sustainable fashion and textiles, along with our core showcase of globally sourced reduced impact fabrics. One of these organisations is Historic Futures, who have spent more than 10 years exploring value chain transparency and traceability. This work is integral to knowing more about where our products come from, how they are made, and the impact they are having on both the environment and on global communities. Historic Futures are currently developing String3, so we spoke to co-founder and director Tim Wilson to find out more, and we found what he had to say so interesting that you can read it in full here. TSA: What was the motivation to start Historic Futures and to work on improving supply chain transparency? HF: I had been working in the value chain / traceability area for many years and realised there were no solutions focusing simply on getting reliable data from the whole chain without linking to specific product or production systems (e.g. organic). The triggering event – to actually get started – was a conversation with Nike that demonstrated how difficult it was to collect reliable data from the value chain. TSA: Historic Futures makes it possible for companies to collect and manage value chain data – can you tell us a bit about how you do this? The basic concept is very simple, and is analogous to situations we all face everyday. I need to speak to somebody at Company X about their new product, but I don’t have their contact details. I could ask my colleague sitting next to me, who has read about Company X, what they know about this new product and just go with that. It’s really quick and easy, and they probably know more than I do. But if I want to rely on the information – to write an article in the press, or to use in a presentation perhaps, then I’d want to speak to someone who really knows, inside Company X. It’s the same problem with value chains. I need to know the country of origin of the raw materials used in my product – because my brand has made a commitment on this, or because the law now requires me to know. I could ask my supplier – who sells me the finished goods – that’s quick and easy and they probably know more that I do, but I can’t rely on the information. Our String3 system fixes that problem – I send my question to my supplier inside String3, and it provides the tools for my supplier to send it on to their supplier. There might have been several suppliers and even they don’t actually work with the raw materials. String3 makes it simple for everyone to keep passing the question on until it gets to those who really know the answer. Sounds very simple, in reality the system is quite sophisticated – making sure that only the answer to the question is ever shared, not the details of each actor in the chain, keeping people informed of progress, benchmarking performance and so on. TSA: You’re currently developing the newest phase of String, what will this be able to offer clients? HF: String3 – the service we are working on now – will make it simple and efficient for people to find information about how and where their products were made. It will save them time and provide answers which are more reliable than other methods. Interestingly it will also provide a means to benchmark supplier performance – clearly identifying which suppliers and value chains are good at providing this information, driving continuous improvement. Crucially for suppliers, the service can be used free of charge and it does not disclose sourcing details to customers – so suppliers can confidently use the system to help their customers get answers to legitimate questions about raw material country of origin or value chain certification status. TSA: We’re looking forward to showcasing Historic Futures at the Future Fabrics Expo, which is geared towards the fashion and textiles industries – can you tell us about some of the work you have done in these industries? HF: We’ve been working in fashion and textiles for nearly 12 years – since the very beginnings of HF. During that time we have delivered projects for many of the world’s leading brands. Those projects have ranged from strategy formulation to large scale data collection and reporting – all focused on value chain mapping, to understand how and where products were made. TSA: Are there some positive impacts you have seen from your work that you can tell us about? HF: We’ve seen benefits across the entire value chain from better, bolder claims about finished goods for brands, to improved relationships between supplier and customer for sourcing agents, to improved inventory control and “right first time” rates for manufacturers. We’ve seen suppliers get new business through being able to deliver value chain information and improved efficiency in differentiated raw materials such as organic cotton or recycled polyester. There are many ways that reliable value chain data can deliver benefits, but the area that seems to be the most consistent across geographies and sectors is this ability to obtain reliable data – when needed – for products that contain raw materials where country of origin or compliance with some 3rd party standard is important. TSA: What do you think are the biggest obstacles with incorporating more sustainable materials into supply chains of different sized companies? HF: Sustainable materials is a difficult term – I’m not sure anybody really knows what it means – but there are clearly important choices to be made about materials and production processes in terms of the impact they have on people, planet and profit. For buyers, understanding what’s in your product – and whether it’s what you specified – is a critical first step. For suppliers, being able to demonstrate good practice and regulatory compliance throughout the value chain quickly and efficiently is vital if better performing materials are to become mainstream. You can learn about String3 at the 4th Future Fabrics Expo on 28th – 30th September at Olympia Exhibition Centre, London. We’ll be showcasing the work of several organisations and projects, as well as hundreds of individually sourced and researched materials with a reduced environmental impact. Over the years we have researched thousands of sustainable textiles sourced from dozens, even hundreds of mills from around the world. However we have not until now had the opportunity to really showcase what Africa has to offer, something which is essential if we want to show what African industry is capable of, especially if it receives investment and support from the industry. The House of Lords recently hosted a roundtable event to discuss sourcing African-Made goods, which highlighted the fact that profit to Africa is decreasing, whilst value added abroad is increasing, even though in the last decade a number of the fastest growing markets have been in Africa. This imbalance coupled with volatile cotton prices is something that the Aid by Trade Foundation (AbTF) aims to address with its Cotton made in Africa (CmiA) initiative, working with small holder farmers in Sub-Saharan Africa to improve social, economic and ecological living conditions. CmiA and a range of CmiA fabrics will be included in the 4th Future Fabrics Expo (28th-30th September, London), but before then we wanted to share with you everything you should know about Cotton made in Africa. TSA: What was the motivation behind initiating CmiA? CmiA: Cotton plays a key role in fighting poverty in Sub-Saharan Africa and contributes to food security in many countries of Sub-Saharan Africa. So far, this potential has often been underused to further economic development. Volatile cotton prices and low productivity leave African smallholder farmers struggling to make a living from cotton production. Against this background, the Aid by Trade Foundation (AbTF) and its Cotton made in Africa (CmiA) initiative have been initiated. Since 2005, we have improved the living conditions of cotton farmers in Sub-Saharan Africa by activating market forces and creating a quality label for sustainably produced African cotton. TSA: What are CmiA’s goals? CmiA: The goal of CmiA is to improve the social, economic and ecological living conditions of smallholder cotton farmers and their families in Sub-Saharan Africa. Our commitment is not based on donations, but rather, on the principle of helping people to help themselves through trade: African smallholders learn about efficient and environmentally friendly cotton cultivation methods through agricultural training provided by our experts. At the same time, we establish an international alliance of textile companies which purchase the CmiA raw material and pay a licensing fee to use the label. Income from licensing fees, are reinvested in the project regions of Sub-Saharan Africa. At the end, CmiA farmers and their families profit from these investments. The underlying philosophy is already reflected in the name of the Foundation – “Aid by Trade”. Additionally, Cotton made in Africa’s purpose is to give African cotton the recognition it deserves in international trade and to lend a positive, recognizable “face” to a hitherto anonymous mass product. TSA: Can you tell us more about the cotton industry in Africa? CmiA: Almost 10% of the world’s cotton production is grown and harvested in Sub-Saharan Africa. Sub-Saharan Africa is the fifth largest cotton exporter worldwide. Following the USA, India, Australia and Brazil around 2.2million smallholder farmers in West and South-East Africa cultivate cotton. Often it is grown on small lots and in rotation with staple foods, such as grain, corn and peanuts, within the context of very diversified production systems. Although cotton is one major cash income, 80% of the African cotton farmers have an income per day of less than 1.5USD. By means of CmiA, the Aid by Trade Foundation tries to support cotton farmers. The initiative strengthens their resilience towards external effects like volatile prices and increasingly adverse climate changes that keep them from improving their living conditions and that of future generations ensure their food supply and preserve their health as well as the environment. TSA: Can you give some examples of the effect CmiA has on farmers, the environment, and local economies? CmiA: Since 2005, CmiA has created a large impact on cotton farmer’s lives and that of their families because the focus of our work are the people in the growing countries in Africa. As an inclusive standard relying on a constant improvement plan for participating farmers, the initiative has become a major player in the cotton sector across Sub-Saharan Africa. Whereas CmiA started with 150,000 in three African countries in 2007, the initiative expanded its work to up to now more than 415,000 smallholders in six Sub Saharan African countries. Family members included more than three million people profit from CmiA. Due to training in efficient and modern cultivation methods CmiA farmers have been enabled to increase their crop yields compared to a control group that is not part of the initiative by an average of 23% and thus to also improve their income. By working with CmiA, the employees in the ginneries benefit from fair contracts and prompt payment. Through community projects, CmiA improves the educational infrastructure in the project regions, ensures a better drinking water supply and strengthens the rights of women. These projects that go beyond pure cotton cultivation strengthen the local community and contribute directly to improving the living conditions of African cotton farmers and their families. Additionally, CmiA has a proven significantly better environmental footprint than conventionally grown cotton. As CmiA cotton is exclusively grown under rain-fed conditions, it thereby saves around 1,500 litres of water translated to the amount of cotton required to make a t-shirt. During the cultivation of the raw material, conventionally grown cotton produces 2.4 times more greenhouse gas emissions per kilogram of cotton fibre than CmiA. CmiA: Our plan moving forward it to expand the positive effects of CmiA on the cotton industry to the textile industry on the African continent. We aim to use our experiences to support the establishment of a sustainable textile value chain in Africa. As major international textile retailers increasingly look to diversify their sourcing, we see many opportunities for Africa’s textile to capture parts of these markets. CmiA together with its partners are therefore pro-actively promoting the concept of “Textiles made in Africa” produced for African markets as well as for export. TSA: How do you think initiatives like the Future Fabrics Expo can help organizations such as yours? CmiA: For us, the Future Fabrics Expo is very important as it offers the chance to create awareness for our CmiA quality label on the UK market. Thanks to the expo, we can directly interact with companies and other members of the textile value chain who are searching for an optimal solution for ecological and ethical challenges within the textile value chain. Why? We are the first initiative that made it possible to introduce sustainable cotton into the mass market and thereby create a win-win situation for every participant – from cotton farmers to textile companies and consumers worldwide. Cotton farmers and their families profit from license fees retailers pay for purchasing CmiA cotton as we re-invest the income from license fees in the project regions. Partnering textile companies obtain cotton produced under socially and environmentally improved conditions without having to pay a significantly higher price. They can thus achieve their sustainability as well as accountability goals. Consumers can directly support African smallholder farmers and their families by purchasing CmiA labelled products. With every purchase, they make a valuable contribution to Africa’s long-term future. CmiA: Industry professionals and consumers can get involved in various ways: You can register for our CmiA newsletter to stay informed about our work or follow us on Youtube, Facebook or Twitter. In addition, you have the chance to support our work by purchasing CmiA labelled products. Finally yet importantly, interested companies or traders can make a valuable contribution to the future of hundreds of thousands of people in Africa by becoming partner of our initiative and purchasing the CmiA verified cotton. You can see a range of CmiA fabrics and find out more at the Future Fabrics Expo, 28th – 30th September, London. Elmer & Zweifel, a German textiles company founded in 1855, have been showcased in the Future Fabrics Expo by The Sustainable Angle since 2012 due to their extensive range of high quality certified organic cotton fabrics, which are available in both small and large quantities. In addition to retail and wholesale finished fabrics, they also produce greige goods and their own brand of organic cotton products called Cotonea. A selection of their fabrics can now be viewed on the Future Fabrics Virtual Expo. We spoke to Linda Schall from Elemer & Zweifel to find out more. Elmer & Zweifel have been working towards creating a more sustainable company and product offer for some time, and have extensive knowledge and control of their supply chain. 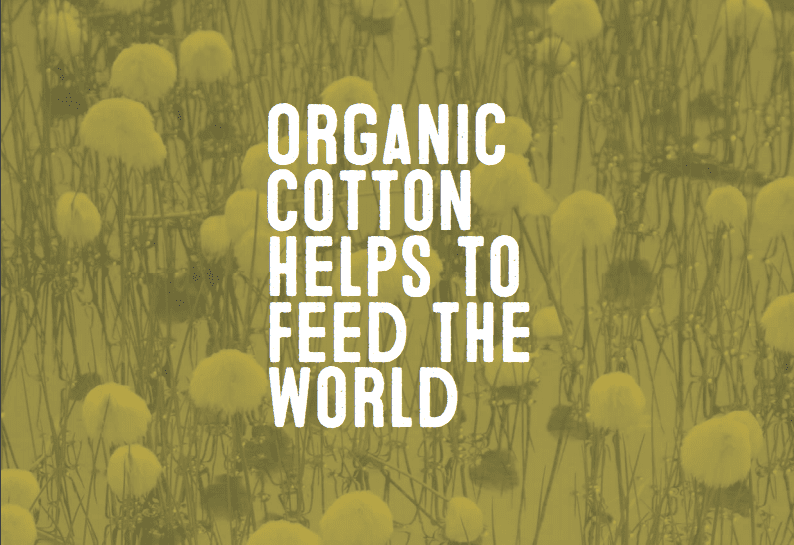 For starters, they have their own organic cotton plantations in Kirgistan and Uganda, with Swiss NGO Helvetas training the farmers in organic agriculture, to produce high quality cotton certified by IMO. The cotton is then spun in Turkey and Germany, and woven and finished in the Czech Republic by Elmer & Zweifel. All stages of the supply chain including wet processing are certified by GOTS. According to Linda, the original motivation to start offering more sustainable fabrics was “to improve social and environmental factors over the entire textile supply chain.” They also believed that to create better products, transparency had to be established. She says initially they were producing more sustainable textiles based only on demand, but then more and more clients started requesting these products, leading to the introduction of a permanent organic range – testament to the impact designers and buyers can make simply by asking questions and requesting more sustainable materials. As a business, and especially as a business that wishes to continue producing more sustainable textiles, growth is still essential. “It is for example important that the cotton projects in Uganda and Kirgistan that we support are financially viable, and hence, financial turn over needs to increase.” Elmer & Zweifel are seeing increased demand for sustainable textiles, but it is essential that as an industry we continue to seek, develop, and demand more sustainably and ethically produced materials and products. Linda believes that one of the most pressing challenges in the industry is around ethical and social labour conditions, which need to become fairer, especially in countries such as Bangladesh. In terms of sustainable textiles, one challenge the company has identified is that there are still requests for products which at the moment are not possible to produce in an ecologically sustainable manner, for instance ‘non-iron’ fabrics. However considering the amount of innovation we have been seeing in recent years, it may be only be a matter of time until that is possible. 100% organic cotton chambray. Elmer & Zweifel also produce plain and patterned knitted and woven organic fabrics. This approach to consumption, and to a lack of focus on quality, requires an industry and society wide systemic change, in which Elmer & Zweifel believe both the consumer and industry have a part to play. Combining a refined outlook on how we buy and wear fashion, along with the use of higher quality and more sustainable fabrics would certainly have a positive affect on the damage we are causing to our environments and society. You can find out more about Elmer & Zweifel and see a range of their sustainable fabrics on the Future Fabrics Virtual Expo, which is generously sponsored by Elmer & Zweifel and Kassim Textiles. Elmer & Zweifel will additionally be showcased at the 4th Future Fabrics Expo in London, on 28th – 30th September 2014.